I didn't think I would have a lot to say about this race, but this post turned out longer than I thought. There are plenty of local 5K's around here during the summer but I've limited myself to doing one race per month. For the month of August, I originally wanted to run the Love Run that I did last year, but I skipped it because it was just way too hot and I remembered how miserable it was last year. To be honest, I only allowed myself to skip it because I knew there would be another race this weekend! 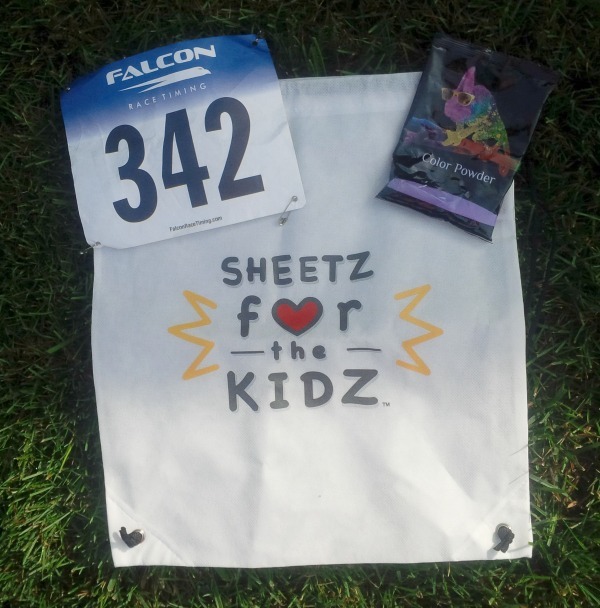 So this weekend's race was the Color Run sponsored by Sheetz. I was only a spectator last year. The race took place down at our Island Park, but in the wooded trails. Scott and I scoped out the trail the night before so I could see where I would be running. I mentioned in the weekly wrap that I ended up having a sore throat when I got home. Well Saturday morning when I woke up I felt miserable. My throat was so dry and so very sore. I got up at 5:30 am and had a Sucrets and laid their till 7am. I thought about skipping the race but knew it was my last opportunity to do a race in August. I got myself up and decided to do a "test run" to see how I was feeling. I did almost 2 miles near my home and decided I could handle it. I don't usually carry water for a 5k, but I decided to bring my own in my flip belt since my throat was so sore. I didn't register for this race in advanced because after the processing fee, I was only saving $2 and there was a stipulation that said if the path got flooded, the race would take place at the High School track. Since the race takes place on the island, there is a good chance that part of the route could get flooded if we had a good rain ( it's been flooded before). Running a race on a track did not sound fun, so I waited till race day to register. When we registered we got a drawstring bag and a pack of color. I guess runners were putting the color on themselves before they even started to run. My goal was to not get any color on me, so I did not open my packet. Scott came to the race with me and then a few minutes before the start time, I saw my mom, dad, and nana. It was nice to have them all come out and spectate but because of the way I had been feeling, I had a feeling this wasn't going to be a very good race for me. Like I mentioned in the weekly wrap, this race was a total trail race. Lots of running on grass and dodging roots. We started by doing a half lap on the south trail, exited the trail by the boat launch, and up and around the north trail. We continued back on the South end of the island and instead of going straight on the path, it cut up to the left into a grassy area. This is the area I would have totally missed had I not scoped out the route the night before. In fact, there were two girls that were behind me the entire race until this point. They passed me and kept going straight. I think they heard me turn up the hill because then I heard them say they messed up. Somehow they ended up passing me at this point. The path was well marked though. 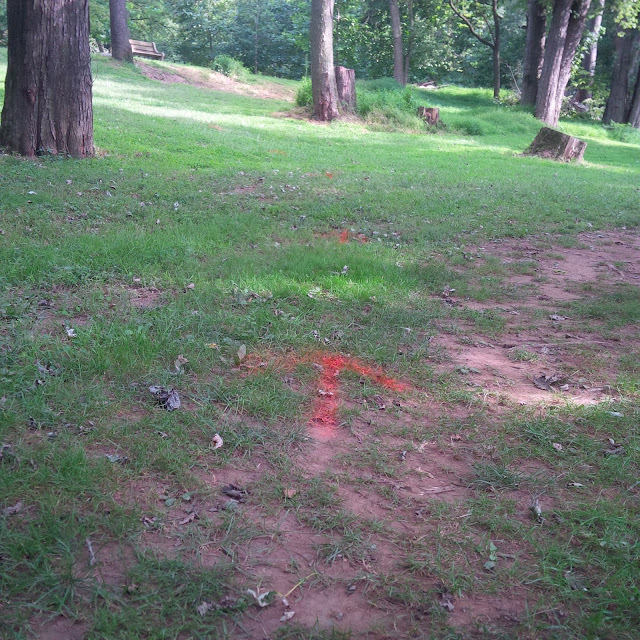 Not only were there orange arrows spray painted on the ground, there were also yellow and pink arrows that were on signs that were staked in the ground. 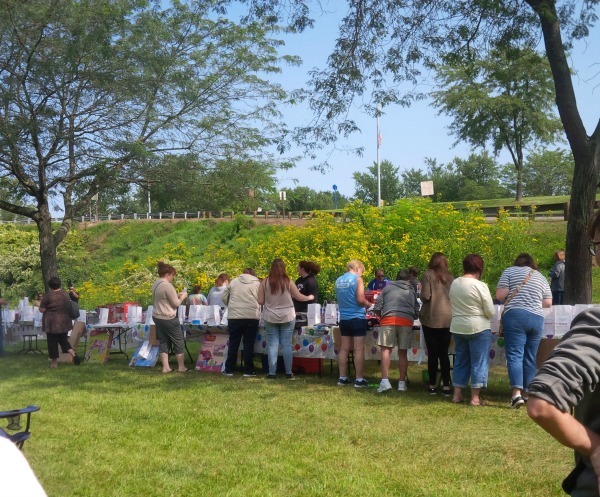 If you wanted to participate in the color fun, there were about 6 to 8 color stations where you could get doused with color. Even though I opted to not get doused with color, I sure inhaled plenty of it as I was running behind others who were getting sprayed. Even though I didn't stop for any, I was surprised to see that this race had 2 water stops. Actually it was 4 for the entire race because we ran by each stop twice! 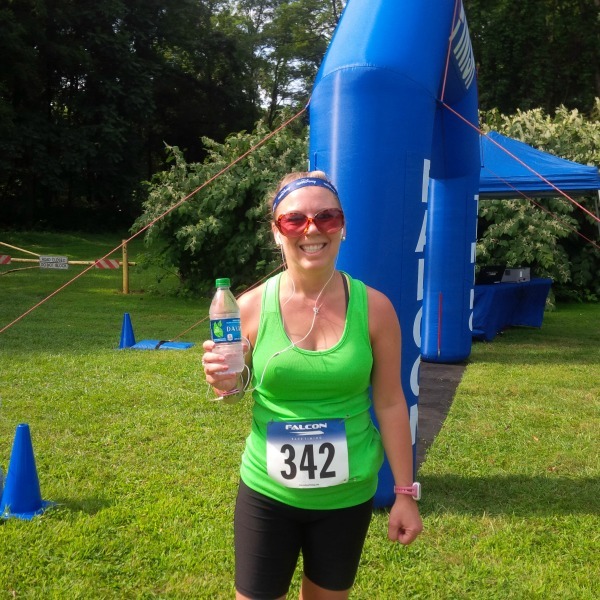 For a trail race, I finished in a much better time than I had anticipated! Shortly after I finished I noticed a tent where the official times were being printed off. I went over to the tent and was excited to see that I had won first in my age group. I had earned 2nd place wins at other race but never a first. When it was time for the awards to be announced, it turns out I really only won second place. After I looked at my time originally, there had been an update. I am not disputing the results in anyway, I am just curious as to how that happens? If that runner came in before me, Shouldn't her name and time have been printed before mine? There were only prizes for 1st and 2nd places in each AG so I was super happy to have won 2nd. EXCEPT by the time they got to my age group, they had run out of medals! What?!?! The lady apologized and said it was her first time organizing this race. She had us and the male winners in that AG write our names and address down and said she would mail the medals to us. 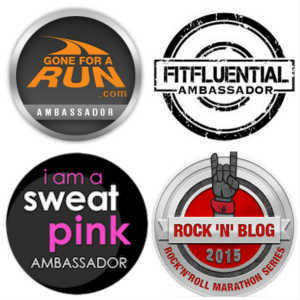 I wasn't mad because of course things happen, but regardless of how many people come to run a race or how many people register on race day YOU STILL NEED THE SAME AMOUNT OF AG MEDALS. It's not like they were giving medals to every runner who finished and they just happened to run out. I don't understand how you can make a mistake like this but then again I've never organized a race so I am not one to talk. After the race awards, there was a huge Chinese Auction. While I was running the race, Scott and my dad were buying tickets for the auction. This lasted for about an hour and we had to stay till the end because my dad had put his raffle tickets in the basket for some tickets to a baseball ball game, Which he ended up not winning anyway. After the Chinese auction, we went out for lunch ( I had a slice of peanut butter pie to celebrate) and then ran some errands. I don't know if it was all the time spent out in the sun or what, but I felt awful by the time I got home. I took a shower and was out for the rest of the night. 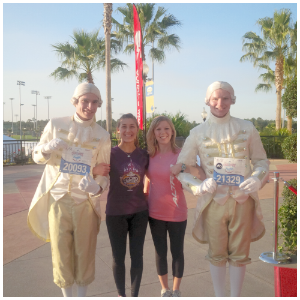 Even though I only ran a 5K, I literally felt like I had ran a marathon. My entire body ached and I had a major headache. I'm thinking that sore throat was the first sign that I was coming down with a cold. *Edit: I did indeed catch a full blown cold. Well congrats on your AG it-will-be-in-the-mail award! And you look like you did dodge most of the color powder -- or maybe you inhaled it all? I do hope you feel better soon. What is a Chinese auction? I inhaled a lot! I Chinese auction is where you buy raffle tickets and then you put your ticket on an item you want. If your ticket gets drawn, you win that item. I don't know why they call it a Chinese auction. Congrats to you! Those color runs are hard because so many people show up just to have fun and walk. I can't believe you dodged all the color you need an extra medal for that! Well, I am sure that medal is in the mail! Hope you feel better! I did get quite a bit of blue color on my black shorts but you can't see it well! Congrats on the AG place--medal or not, it's still a win! I am sorry about the cold -- hope you feel better soon. But good job with the AG award while sick! That's pretty impressive. Boo to not having enough medals & you're right -- no reason for that. I never even check AG awards . . . Thanks Judy! This cold seems to be hanging around longer than I thought! I think you are the first person I've heard of who signed up for a color run and specifically tried to avoid getting color thrown on you! Too funny. Glad you had such a great run and big congrats on the AG award; hope you actually get the medal now! I really just wanted to do the race since I miss last weekend's race. Having color doused on me did not sound appealing although I did get some on my shorts. Congrats on the AG place! That's so weird the results changed. I've had them change in the past but I moved up, probably because somebody was DQ'd. Hope you feel better fast! Yea, I thought that was weird too since nothing changed. Congrats on the AG place. Bummer that you didn't feel awesome. I had to laugh that you did a color run and purposely avoided the color. I'm pretty sure I'd be the same way, unless I was running with my kids. I think the kids loved it! Oh man.... sorry you ended up with a cold. I'm just getting over mine. That is the sort of thing that IRRITATES THE FIRE OUT OF ME... not having enough of something for a race that is OBVIOUS. Exactly, you know exactly how many winners there are. Which makes me wonder about the placement - if they messed up the medal count, they could have easily messed up the placements of runners. UGHHHH. 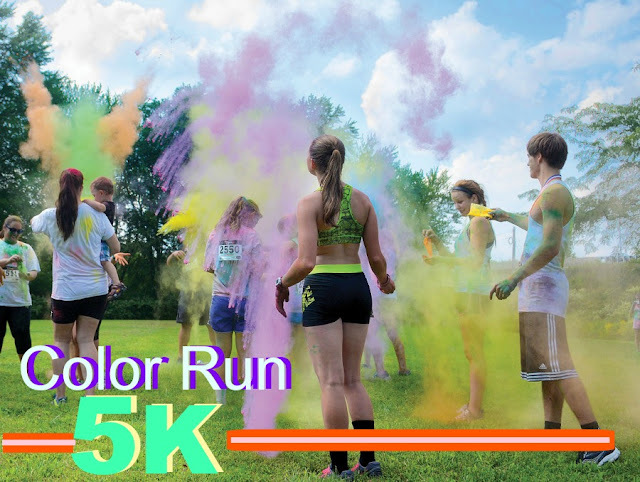 So this isnt the actual "Color run" right? They dont do winners or anything... but I bet it was a lot cheaper - The actual Color Run is RIDIUCLOUS. Like $50 to enter for a 5k - that's not even timed or chipped. It's mainly now just a walk for parents with kids in our area. Hope you're feeling better... & you get your medal! I don't believe this is the official color run but it is chip timed and there were winners. The color run I did ended up being fun, but I was trying to avoid color at the last color station. It got hard to breathe at the end, especially after doing walk/run. I hope your cold gets better. Was your color being shot out by machines or by people? Ugh, what a bad time for the cold to hit :( And the medal thing is so weird! Like you said, they had to know how many medals would be needed for age group awards. Hopefully you get the medal in the mail soon. I'm sure it will come in the mail but it's just not the same as receiving it on race day! Congratulations on your AG placement! When I first saw the picture on instagram, I thought your water bottle was your trophy! Poor organization skills! can't believe they didn't have a medal for you! I hope you are feeling better, cold summers are awful. The water felt as if it were a trophy...haha. OMG!! You would think the volunteers would have been taught what to do. I can tell ya exactly probably what happened. Years ago I had the same thing. I came in first in age but later the official results showed second. It was because the first place overall was in my age so they took her name off the age until they realized the mistake later. But either way you did incredible!! That makes sense but the lady who won overal was not in my age group. No they clearly stated on the registration how many AG awards they were given out. They messed up but did apologize. I am not a fan of the timing company that did this race. They've had issues at other races and I don't like how they do their age groups. Congrats on your AG win! :) I give you lots of credit for getting up to run a race when you're not feeling well- especially when you didn't pre register so it's not like you would've lost money. That is ridiculous they ran out of medals!!!! Congratulations on your race! I've never done the Color Run, it sounds like the trail course was pretty cool - usually I see them in less exciting locations. That's too bad about the medal, but hopefully you'll get it soon! That's great that you won an AG award! It stinks that they gave it to someone else!